For your Horses first treatment please allow a minimum of 2 hours, I will need to see your horse walked and trotted up and possibly lunged. It may be that I also need to see the tack so please have this to hand. If you have any questions please do not hesitate to contact me. 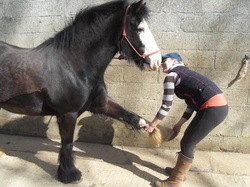 Each treatment is tailored to your horses needs at the time of massage, and if any follow on treatment is required I will discuss this with you. Stretches are done at the end of a treatment to compliment the massage routine carried out. Some of these stretches may need to be done within your routine to help your horse get the best results from the session, again this will all be discussed and fully shown and explained. 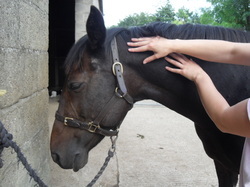 I am a fully qualified, registered and insured equine massage therapist, I have an in-depth knowledge of the horses muscular structure and how areas of tension can affect the horses well being. My training allows me to detect and treat muscles and muscular related problems. I am no a veterinary surgeon and will recommend that a horse is seen by a vet if I deem that this is appropriate if the conditions found are outside of my professional field. To work within my duty of care to both you and your horse I require veterinary permission prior to treating any horse (Veterinary Surgeons Act 1966), this can be gained by a phone call either from myself or from the horses owner. I know things crop up in life & people need to cancel their appointments at short notice but as this is my business and my livelihood I ask for as much notice as possible if you need to re-arrange your appointment. Cancellation less than 24 hours before appointment - full treatment cost due. Cancelation less than 48 hours before appointment - half treatment cost due.